Normally a pioneer of the latest console technology, Capcom has been struggling to get itself up and running for the PlayStation 4 and Xbox One. 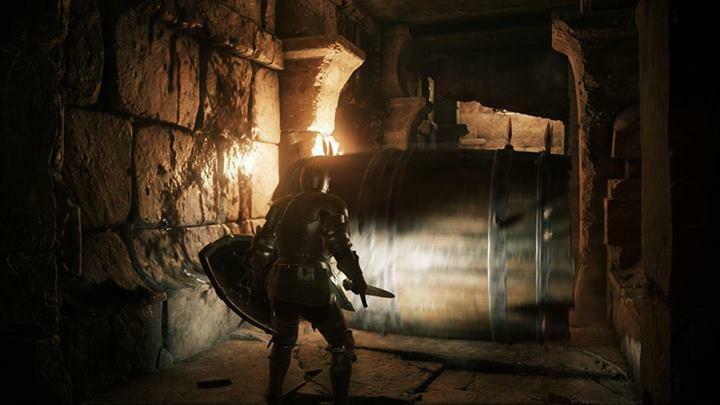 Its sole original game for the PlayStation 4, the free-to-play "not Dark Souls" action RPG deep down, is set to show off Capcom's new Panta Rhei graphic engine, but delays and lack of news on the beta test have made fans nervous and impatient. Producer Kazunori Sugiura has apologized to fans (again) through the official Facebook page after missing his self-imposed July deadline, and he has promised (again) that you'll be hearing information on the beta test before the end of the month. To further apologize, he also released a screenshot (again) to prove that development is still underway. Sugiura describes the screenshot as one of the many traps you can stumble across in deep down's randomly generated dungeons. These spiky barrels have caught him off guard many times. More than just an interesting looking action RPG, deep down is highly anticipated for giving a look into how Capcom plans to streamline game development under a single game engine, similar to EA's approach of developing all games with the Frostbite or Ignite engines. Panta Rhei is expected to power the next Resident Evil game and whatever else Capcom considers developing in the coming years. We just need to see it in action first, but that is taking quite some time. All we have from Capcom on the new consoles is Dead Rising 3 on the Xbox One and PC, a game not from its Japanese studio that uses a unique graphics engine. We'll be back with more on the beta for deep down after Capcom announces it.